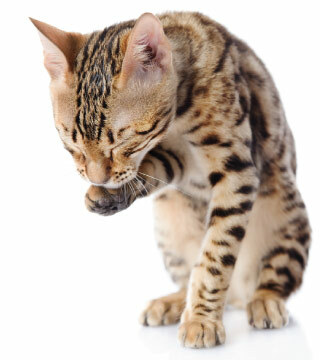 Most veterinarians typically do not recommend cutting your cat’s fur. For some long-haired breeds whose fur becomes matted or hopelessly tangled, those tangles may need to be cut out. Also there are a few styles such as the “lion’s cut” which have become popular among owners of long haired cats. However, these cuts require trimmers that can make cats very uneasy, startled and unnecessarily traumatized. These are services that are best left in the hands of professionals and may require sedation. Cost: $45 and up. Please call for pricing. If your cat is not keeping up with his grooming, or you notice anything unusual with his skin, make a veterinary appointment today. Our staff is available to take your call at 504-290-0025.